UK startup Incus Performance believes it's come up with a wearable that triathletes are going to lap up in the water. The Nova is a device built for swimming, worn on the upper spine and held in place by apparel that the Loughborough-based outfit has also developed. It's packed with higher quality versions of the sensors found inside of smartwatches and motion capture systems. With those sensors the Nova is able to track metrics such as strokes, breaths and kicks on both left and right sides to offer rich data on stroke technique. Once that data is captured and synced to the companion app (web and smartphone), detailed insights are provided to help swimmers use the data to improve. While the Nova is currently optimised for pool swimming, Incus Performance is already working on how the wearable and the analytics system it underpins can give you that data hit when you're cycling or running. The key here is to provide a system that offers better communication between athletes and coaches than what's currently available. Chris Ruddock is lead engineer and managing director at Incus Performance. Ruddock, a club swimmer and amateur swim coach, started the company back in 2009 and began to develop the system as a student at Loughborough University in 2014. The name Incus is taken from the name of the bone Ruddock lost in an ear infection, resulting in a loss of hearing in his left ear. It's where this concept of quality of communication between swimmer and coach really stems from. "We’ve seen from the triathlon side of things, swimming is the hardest thing to train for," Ruddock says. "We've seen some trackers that are great, but simply haven't taken that holistic approach to help athletes train better with data, whether they're amateurs or elites." While many swim-friendly watches and wearables dish out data like stroke counts, lap counts and SWOLF scores, the Nova will be able to measure aspects such as body roll, something that has not been available outside of a performance lab. With that additional high-quality motion data, it can closely examine technique, pinpointing areas to help you move faster in the water and on land (when that support is ready). "A stopwatch is good if you want to know how long it took you to get from start to finish," Ruddock says. "We are interested in how you got to the finish and how you can improve that in the future. "We are able to measure how that person gets through the water through their stroke. We are able to understand what is happening in their technique to enable them to move faster. So as a result of your body angle, stroke and other data, you can see how far you’ve moved through the water. It’s a bit like a power meter for cycling, where you're providing an objective measurement of output. Because of the AI we are also using, we can link these things together and decipher what works for you and doesn’t work for you." Where that Nova wearable is positioned on the body was crucial in being able to provide those advanced measurements in the water. While Incus played around with different positions where the device could live, ultimately this was the ideal place not only for tracking the motion of the body moving through the water for swimming, but also with some benefits for the other triathlon disciplines. "We tried a couple of different places, but we’ve stuck to this location because you can pick up some new stuff in running – and cycling we can’t talk about just yet." Development on the setup started two years ago after Incus was awarded an Innovate UK grant. It's been working with coaches and athletes at Loughborough to understand the problems swimmers face and ensure that stable, high-quality data capture and analysis is up to scratch. "We are constantly validating and benchmarking against athletes and competitors in the field," says Ruddock. "That testing has predominantly happened at Loughborough, but we are opening up our soft launch working with athletes and coaches from May 2. We are giving them the system to help make improvements and changes ahead of launch. "We had challenges with the physical element of the system testing something in harsh environments like water, but we also had the challenge in validating systems that nobody has started to measure. We had to use robots to test body roll measurements for instance." What can a SWOLF score actually tell you? The Nova wearable on its own will cost £319.99, with a launch planned before the end of the year. It will also be available in a bundle that includes the apparel to hold it in place for £349.99. Meanwhile a monthly subscription model will offer additional insights and personalised analytics from £6.99 or £12.99. When the running and cycling support is ready, anyone who already owns the Nova will be able to update it to get a wearable built for all triathlon disciplines. The Nova is ANT+ enabled so it'll work with heart rate monitors and power meters in the future. 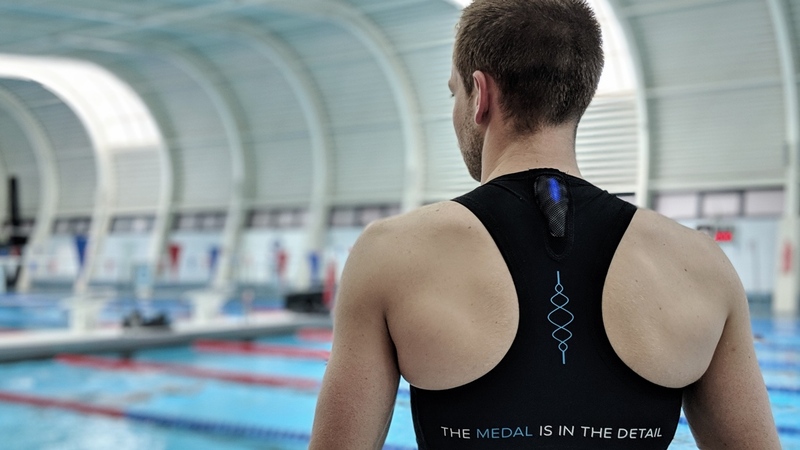 As well as the device, Incus has been developing more apparel with designers that have worked on skin suits for the British teams at the Olympic Games, offering more ways to don the tech in the water. It's also working towards adding more analytics geared around trend spotting in the data captured by its wearable. So it's clearly a device that will evolve over time to be an even better companion for your triathlon training.